Does Beer Batter Contain Alcohol? Beer batter is a combination of beer and flour commonly used to coat seafood and vegetables, and then deep-fried. Beer is loaded with carbon dioxide as well as foaming agents, which both aid in giving the batter a crisp, light, texture. Beer batter contains alcohol too, but the quantity is very small. Beer batter can include salt and water too, depending on the recipe. Some recipes call for a mixture of beer and soda water, which will give the batter an airier texture but still provide the necessary amount of carbon dioxide. The alcohol content in the batter depends then on the other ingredients used, as well as the amount of beer used in the recipe. The level of alcohol in individual beer brands also varies greatly, with most falling between 3 to 8 percent. One misconception about cooking with alcohol is that it completely evaporates during the process. The truth is that depending on the amount used and cook times, up to 85% of the alcohol can remain. Beer which itself is a mixture of alcohol and water will boil at around 212 degrees Farenheit. 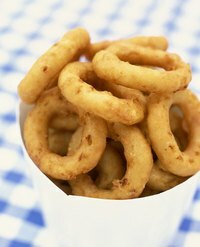 Beer batter is typically fried at a temperature in excess of 350 degrees Farenheit. This temperature allows for some of the alcohol to evaporate, but since frying times are usually very short, it will not be much. You will not get drunk off of beer batter but if you are looking to avoid trace alcohol content for any particular reason, you can easily make recipe substitutions when cooking at home. Consider what you are going to cook, and what flavors will pair well together. When working with a white fish like cod, swap out a light beer for a dry sparkling white grape juice, in the batter. A rich ingredient like an oyster would typically be battered with a dark beer like a lager, so use something heavier such as a spiced sparkling cider instead. You can give almost any food a great crunch by dipping it in beer batter. Think outside of the batter box and coat apples and bananas for a sweet and salty snack. For a new take on french fries, cover sliced potatoes in beer batter. Meats such as sausage and even hot dogs taste great when given a hit of batter. Think about adding herbs and spices to your mixture to add some zing. The only consistent with beer batter is that it should be made cold and used immediately, as it will otherwise fall flat. Eat By Date: Wine Substitutes: What is a Substitute for Wine or other Alcohol?